December 03rd 2006 - At the front of the room, the instructor tells them to breathe. And when they do, the dolls rise and fall. "How do you feel?" asks the instructor, Michelle Star. "Sleepy," says 15-year-old Brittney Wallace. "Right," says Star, "So when you feel anxious or afraid, you can breath and it will relax you." It's good advice for anyone, but especially for the nearly one dozen children gathered this night at the Children's Developmental Center in Amherst. All of the children are autistic. Autism is a developmental disorder that impacts the brain in the areas of social interaction and communication skills. In 2004, the Center for Disease Control and Prevention estimated that autism occurred in one of every 166 births. Yoga, a practice believed to be 2,000 years old, involves a series of physical postures designed to purify the body and provide the physical strength and stamina required for long periods of meditation. For the children at the Children's Developmental Center, however, the goal is different. Marty Santamaria, a speech therapist at the center, was searching earlier this year for activities to help her students cope in social situations. What she found was an article about Star's yoga classes for special needs children. "We wanted something to help the kids self-regulate," said Santamaria. "They have meltdowns when they feel unsafe, and it's not the kind of thing that would make you or I feel unsafe. It can be when they're entering a new environment with strangers." Star taught her class during a summer camp and the results surprised everybody. Children who often did poorly in activities were enjoying the yoga classes. And in some cases, children with Asperger's Disorder (a disorder related to autism in which individuals often avoid touching others) were having fun interacting with partners and seemed to forget their eccentric behavior. "I'm blown away by how well it works for them," said Star. "When they are in class, I don't see them as autistic children. I just see them as children. It's amazing." Star, who lives in Wellington, began teaching yoga in the 1980s. A suggestion from a co-worker to teach his daughter, who had scoliosis, had great results. After a few months of yoga, the scoliosis was healed. A couple of years ago, Star completed training to specifically teach special needs children. While working with the children at the center, Star made sure the kids had fun. Because many yoga poses are already named after animals, such as dog, cat and snake, Star gets the children to make animal sounds. "We let them make noise and have fun so then, at the end, they'll be more likely to be quiet," said Star. Tom Miller, director of the Children's Developmental Center, is hoping to land grant money to keep the class going. "The first time I watched the children in yoga, I was amazed at how well they listened, followed directions and interacted with each other," said Miller. "It was as if whatever challenges they face on a daily basis were set aside for that moment, and everyone was just being themselves." Santamaria said many of her students were leaving high school to be home schooled, or to just drop out. The stress was too much. "These kids are already on the fringes in school," said Santamaria. "They are used to eating by themselves and they don't make overtures to make new friends." The yoga classes - along with a teen support group at the Children's Developmental Center - have helped to curb that habit. Kids sit next to each other on the mats and often help each other perform the poses. "We needed something to help (the children) cope with life," said Santamaria. "Because when they get stressed out, they can't get back in the water and start swimming again. We are always looking for something to help them gain control." 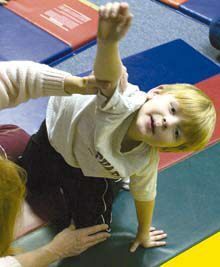 For more information about the Children's Development Center's yoga classes, call (440) 984-2416.